The following article by Eric Roper was published in the June 9, 2014 edition of the StarTribune. A February agreement gives the Vikings and the Minnesota Sports Facilities Authority up to 80 days in a typical year to use the nearly two-block park to be built on land where the Star Tribune now sits. 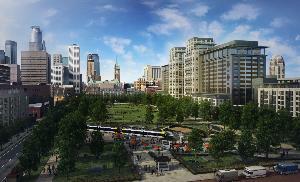 A proposed park next to the new Minnesota Vikings stadium in downtown Minneapolis may not be as public as some had envisioned. Several sports interests have already carved out long chunks of time to use “The Yard,” billed as a major public amenity anchoring a revitalized Downtown East. A February agreement gives the Vikings and the Minnesota Sports Facilities Authority up to 80 days in a typical year to use the nearly two-block park to be built on land where the Star Tribune now sits. In extreme scenarios, that number could grow beyond 100 days a year if the Vikings bring a professional soccer team to the new stadium — depending on how long workers spend setting up for events. Disputes over the park’s ownership and who will pay to operate it remain unsettled, which some fear could jeopardize the project’s completion in time for the stadium’s 2016 debut. For legal reasons, the park is expected to be owned by the Minneapolis Park Board rather than the city, although Mayor Betsy Hodges and others are recommending operations and maintenance of the park be farmed out to a third party. Arlene Fried, co-founder of the watchdog group Park Watch, said the priority booking means The Yard won’t be a public park. “That’s just not the way public parks work,” she said. A major reason for the hybrid usage is that the authority and the Vikings reluctantly agreed to trade complete control of a separate plaza — authorized by the stadium legislation — in favor of a new park that helped spur a major mixed-use development near the new stadium. The authority is used to leaving tents up all season at the Metrodome plaza. Representatives for the authority and the Vikings said they do not plan to hold events in The Yard that are off-limits to the public, although the agreement allows them to restrict access to areas of the park. Michele Kelm-Helgen, the authority’s chair, envisions the park being used for events like youth soccer and football games or a staging ground for marching bands entering the stadium for a competition. “We’re not trying to fence [it] off and make it exclusive,” she said. Plus, she observed, operators of the downtown park will be undoubtedly looking for as much programming as possible. Former Mayor R.T. Rybak raised concerns about the usage in a commentary last weekend, saying the dates outlined in a February agreement “shocked me and should deeply concern the public.” But while terms became broader in February, much was also given away in a December 2013 agreement while Rybak was in office. He also wrote that an “original agreement” only gave the sports authority 10 days to use the space, but the December agreement explicitly gave them 40. Just how many days the park could be booked depends on a number of factors, according to the complex deal. It allows the Vikings to use both blocks for up to 16 games a year — they typically play only 10 — and take up to 72 hours to arrange and take down tents and other temporary structures on the block closest to the stadium. They also have another 10 days to use the park for other types of events. The authority can use the park for 40 days a year, but only erect temporary facilities on the block closest to the stadium. The figures grow higher if a major league soccer team begins playing in the stadium. The team would have similar 72-hour rules as Vikings games for what Vikings Vice President Lester Bagley anticipated would be about 17 home games a year. Those game days would be simultaneously subtracted from the authority and Vikings banked days. Bagley said more news on the soccer team is expected next week. On Vikings game days, Bagley said they anticipate “an evolved tailgating space” taking shape on The Yard, because it won’t allow for the same park-and-grill option of the current surface parking lots. In a statement Friday, Hodges said she expects the Vikings and the authority to be good partners with the community in making sure that the events they program at the park maximize the public’s participation. “That is the intent and spirit of our agreement, and I will push to make sure that it is honored,” she said. Tom Fisher, dean of the University of Minnesota design college and co-chair of the downtown park committee, said he does not anticipate that the maximum days will ever be used. “What lawyers think about and put in contracts usually is … the absolute worst case situation,” he said. Fisher is more concerned with delays — including a lawsuit and ownership disputes — that could hinder the project from being completed when the stadium and Downtown East developments are complete in 2016. In fact, minutes from a recent park committee meeting state that corporate entities have been hesitant to donate to the project because they do not know how the money will be used. The city issued $18.8 million in bonds to pay for the park, most of which will be used to acquire land and demolish the Star Tribune building. That debt is slated to be repaid through parking revenues. Leftover bonding dollars will fund a very basic park. The more complete park, with amenities like a warming hut or playing field, could cost more than $10 million. About $5.6 million is expected to be generated by air rights above a nearby parking ramp and $1 million from the Vikings will aid that project. Annual operations and maintenance are expected to reach about $419,000 a year, according to estimates generated by the Park Board. How that will be paid is unsettled, though assessments on nearby properties are being mulled as one source. The Park Board has been reluctant to take on the project, but a district judge wrote this winter that the board — not the city — has authority to run local parks. The Park Board will likely have to formally weigh in about the ownership and management before major decisions can proceed. This entry was posted in Downtown East Park on June 11, 2014 by citoyen1789.